So many items on my "to do" list this week (like kitting for Stamp Asylum classes in Plano), but I carved out enough time today to step into the work room and have a little creative time. I started with one of the little boards I get at my local Michaels store. Same kind of board I used when I made this. 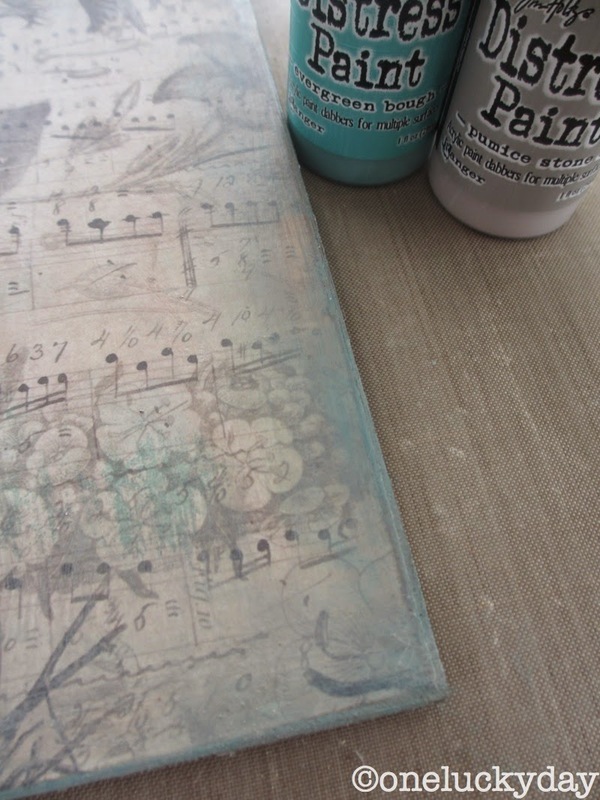 For the project today I started by painting the sides and edges of the board in Frayed Burlap Distress Paint. After it was dry, I gave it a nice coating of Multi Medium. I cut a piece of patterned paper from Wallflower Paper Stash BEFORE I painted the Multi Medium on the board (Multi Medium waits for no one!). Once the paper was on the board (make sure it is secure), I added a coat of MM over the top. I like to add a thin coat, wait a couple minutes for it to start the drying process, then help it along by rubbing the entire surface with my fingers. This not only helps in the drying process but it helps smooth out any brush strokes you may have left behind. I sanded the edges with my Sanding Grip. Then added Evergreen Bough and Pumice Stone to the edges, wiping away the excess with a wet wipe. 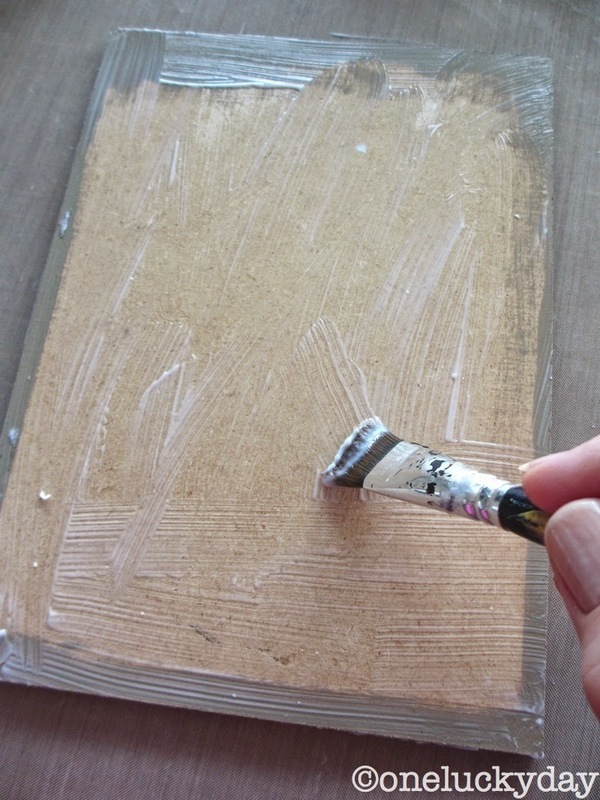 Remember, because I sealed the paper, the Distress Paint can be manipulated while it is wet. Once it's dry, it's permanent. So here is the completed foundation. We picked up some vintage Doilies at Junk Bonanza so I thought I would like to work one in, since the shape seemed perfect. Again, I added a layer of Multi Medium. Another layer of MM over the top will secure the delicate doily. I took a Mini Distress Ink pad ran it around the raised edge of the doily to age the appearance. Wipe away any excess with a wet wipe. I wanted to stamp on the center of the doily so I traced the shape on a piece of tracing paper then cut the center away to create a mask. I used two stamps from the Merchantile stamp set and black Archival ink to create a background. Okay, on to some embellishments. I painted the Letterpress word found. Gosh I love these little letters! Once dry, I used Archival ink to stamp some random text (stamp from the Merchantile set). Then I sanded the letters and inked them. 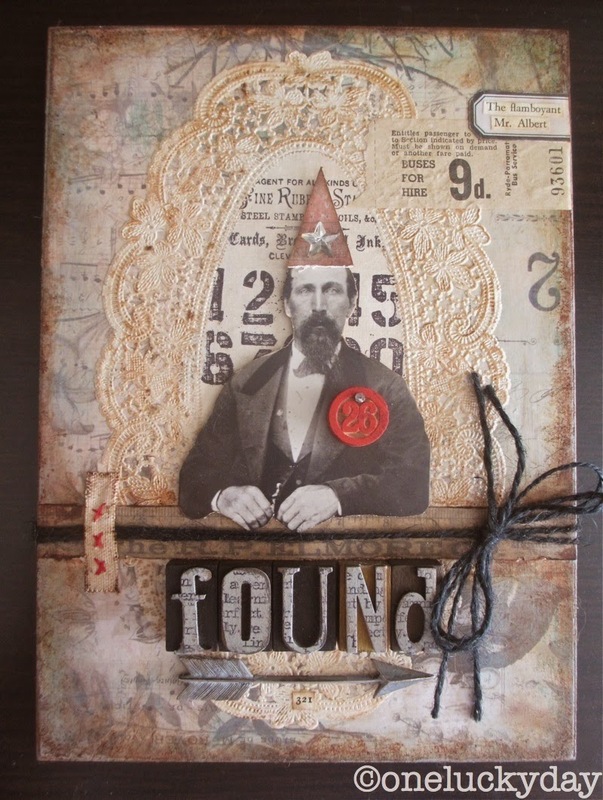 I used Multi Medium to add the letters and a paper ruler strip from the Thrift Shop Ephemera pack. and added him to the center with thin foam tape. You might also notice that I added black Jute String around the panel and tied it into a bow. 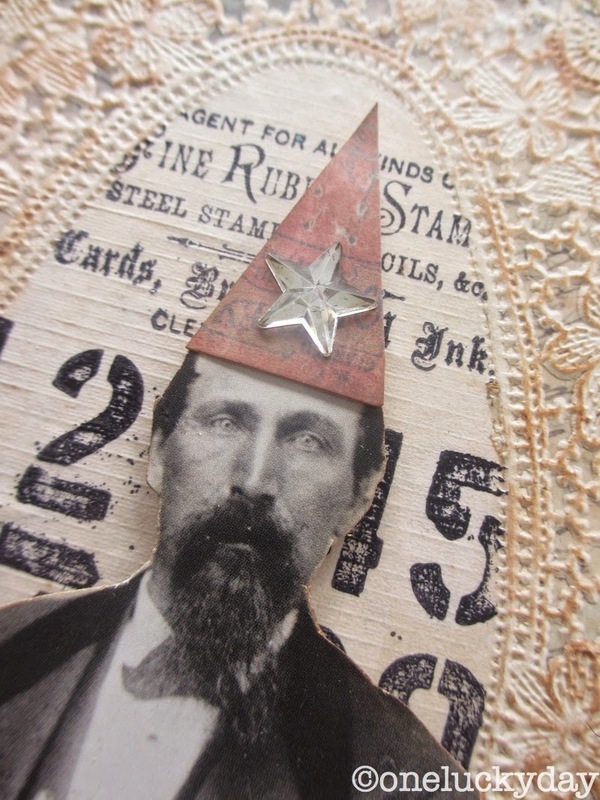 This was looking way to serious so I decided to go a more whimsical route and add the dunce hat with a mirrored star right in the center (hat cut from the ephemera pack). Because the substrate is wood I decided to add a Game Piece to his jacket with a nail. Yep, just nailed it right on. I painted an arrow with Pumice Stone Distress Paint then inked the dried paint with Mushroom Alcohol Ink. Foam tape was added to each end and then added to the panel. I wanted to add another touch of whimsy so I inked a small piece of Sticky Back Canvas then used red thread to stitch X's. Once I was done stitching, I just peeled off the backing and added it to the panel. I wanted a little more definition to the edges of the panel so I pounced the Mini Distress Ink pad around the edge then worked the ink around with a little bit of Multi Medium on my finger tip....finishing up with wet wipe and a pouncing motion. A bit more detail to the top. Love how the Letterpress worked out as a way to ground him to the board. But I think the addition of the red X's on Sticky Back Canvas is my favorite part. You are so creative. Love the use of the doily! Fantastic! thank you miss yaya, you are always so kind. Sometimes I don't feel full of creativity! I guess that is why I keep trying new things! Wonderful! Stamping in the doily was a brilliant touch. I love the added whimsy. I live in Arkansas, but my son lives near the Stamp Asylum in Plano. Do you get there often? When is your class? I'd love to see your work in person. I had to chuckle when I saw your finished piece Paula! Very creative! I'm in love! Mr. Albert will you marry me? This is so terrific, Paula, and reminds me a bit of your 7 Gypsies days. Great step-by-step and I appreciate the tip on painting the arrow. The silver on my elements peels off--painting them is a great solution. Thank you so my Beulah Bee...coming from one of my favorite collage artists, that a true complement! OMG! I love, love, love this. His hat- awesome. The doily-awesome. The bingo badge-awesome. Letter press "found"-awesome. He rocks. Too dang adorable and clever! Oh how I LOVE this man! For me, it was the dunce hat with the star that just melted my heart. TOO dang cute for words. I LOVE this....and you've made it look easy!! Thank you Theresa. I just want people to know that create doesn't have to be difficult. I figure if I show all the steps then maybe people won't be afraid to try something new. Thanks so much for the tutorial. I agree with Theresa...you make it look so easy. I love the hat, but never would have thought of it. It made me laugh after a long day at work! Thanks. So creative and full of whimsy. Love the use of the nail for the bingo marker. Great piece! Love the details! Beautiful job! Isn't creating the "funnest" thing to do? Oh .... And .... Happy Birthday, Paula! i really adore this! Reminds me of the quote "Life is mysterious, why take it serious?" That oval doily is fantastic. Love the masking technique and your red stitches, too. Gorgeous project. Is that board heavy? By the looks of your Big Top post, it is a light weight particle board? What an awesome substrate. TFS. Laura, It is a lightweight particle board - still super sturdy. For me, it's the perfect size to create with. Not too big, not too small. I usually buy a few at a time and just keep them on hand. thank you so very much Shari! You are too kind. I love the sticky back element as well, I actually like the whole piece, the process was fun to follow and easy to understand and it has come together beautifully....though we could not call Mr Albert a beauty.Ha. Totally love this Paula! You are right, the x's are wonderful. Love the hat and words too! Such GREAT Work! 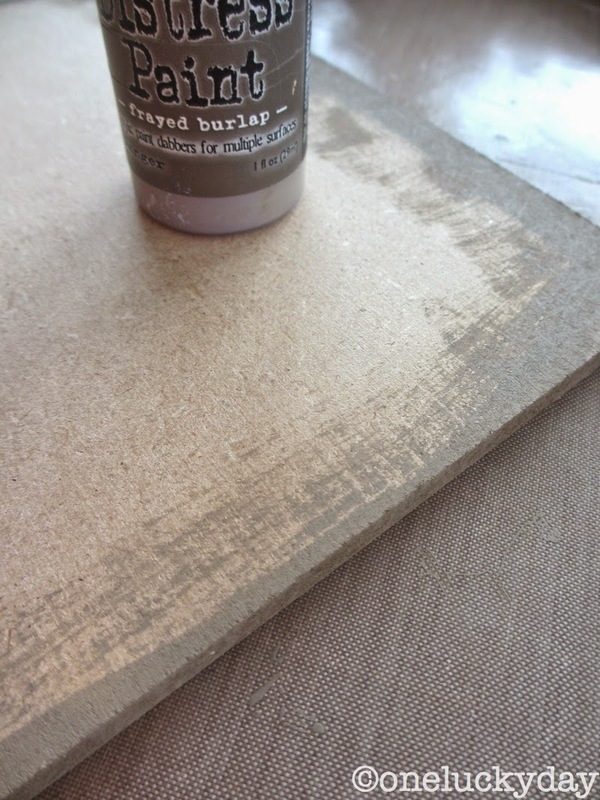 I am getting some of the frayed burlap paint... TODAY! Love the masked stamping. I always forget about using that technique. Thanks for sharing Paula. Knew it would be good after seeing the little tease on Facebook. You did not disappoint! Never been a doily fan until now. I love how it looks once you got ahold of it. I'm going to miss you in Plano. I am remodeling an eighty year old barn on our farm into my new studio. Pictures are coming! Fabulous Paula! The little details you add, like the red X's, just bring so much life to your pieces. Adore the stamping on the letterpress. I love Mr Albert, he looks totally whimsical with his red hat and button on his lapel, the red crosses made me smile...... and I love what you did with the letterpress. Thank you! This is wonderful, I can't stop looking at all the steps you took to make this beauty. You are so talented. This piece is just so fun. I absolutely love it. I just love how you made this found relative!!! I loved your first piece like this so much, I copied it step by step. I guess I know what I'll be trying out this week. Thanks for this great tutorial! WOW! This is fantastic - I love it!!! Wonderful plaque, a perfect combination of vintage finds and Ideology goodness! Thanks so much for sharing your process. Paula, I love to follow your step by step posts. This piece is so beautiful, funny and creative! Thank you. Beulah Bee's just pointed me toward this post - and I'm so glad because I missed it at the time. A beautiful piece and I just love the details like the stamping on the letterpress, and the fantastic way you masked to stamp in the centre of that stunning vintage doily. Inspiring as always.